This press release is an announcement submitted by the FDA, and was not written by Body1. Medtronic, Inc. (NYSE:MDT) said today that it has initiated a recall of specific lots of Quick-set® infusion sets that are used with MiniMed Paradigm insulin pumps. An infusion set is a thin plastic tube used to deliver insulin from an insulin pump to a diabetes patient, and is typically replaced by the patient every three days. Affected infusion sets are reference numbers MMT-396, MMT-397, MMT-398 and MMT-399 with lot numbers starting with the number "8." Medtronic recently discovered that approximately two percent of "Lot 8" Quick-set infusion sets (which represents approximately 60,000 infusion sets out of an estimated 3 million infusion sets currently with customers) may not work properly. The affected infusion sets may not allow the insulin pump to vent air pressure properly. This could potentially result in the device delivering too much or too little insulin and may lead to serious injury or death. Patients should discontinue using "Lot 8" Quick-set infusion sets. The lot number (for example 8XXXXXX) is clearly marked on both the product box label, and on each individual infusion set package. Visit the Medtronic Diabetes website at www.medtronicdiabetes.com/lot8 to view the labels of "Lot 8" Quick-set infusion sets. 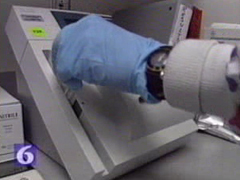 Customers are being asked to return any affected infusion sets to the company. Medtronic is providing customers with replacement Quick-set infusion sets at no additional charge. "Lot 8" Quick-set infusion sets were distributed in the United States, and in limited quantities in a small number of countries outside of the United States. The list of countries affected by this recall is available at www.medtronicdiabetes.com/lot8 or by contacting any Medtronic country office. 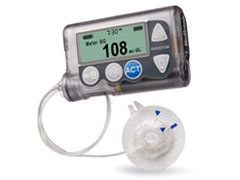 No other Medtronic devices or infusion sets are involved in this recall. "Our commitment to patient safety is our top priority," said Chris O’Connell, president of the Diabetes business unit and senior vice president at Medtronic. "We are focused on ensuring that patients and clinicians have up-to-date information and access to replacement infusion sets. We are working closely with the FDA, and our goal is to make this product exchange as timely and as easy as possible for patients." 800-345-8139 at any time. Adverse reactions or quality problems may also be reported to the FDA’s MedWatch Program by phone at 1-800-FDA-1088, by Fax at 1-800-FDA-0178, by mail at MedWatch, HF-2, FDA, 5600 Fishers Lane, Rockville, MD 20852-9787, or on the MedWatch website at www.fda.gov/medwatch. Medtronic will exchange all affected products at no additional charge. For more information, patients may visit www.medtronicdiabetes.com/lot8 or call Medtronic’s dedicated information line 24 hours a day, seven days a week at 800-345-8139. The Diabetes business at Medtronic (www.medtronicdiabetes.com) is the world leader in advanced diabetes management solutions, including integrated diabetes management systems, insulin pump therapy, continuous glucose monitoring systems and therapy management software, as well as world-class, 24/7 expert consumer and professional service and support.